Kathy is doing a half marathon every month this year. 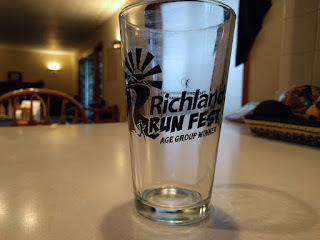 I signed up with her to do the Richland Run Fest half marathon. I wasn't really looking forward to the run yesterday. I hadn't trained sufficiently and it was supposed to be windy and rainy. Fortunately, the weather situation improved and we only had wind to deal with. 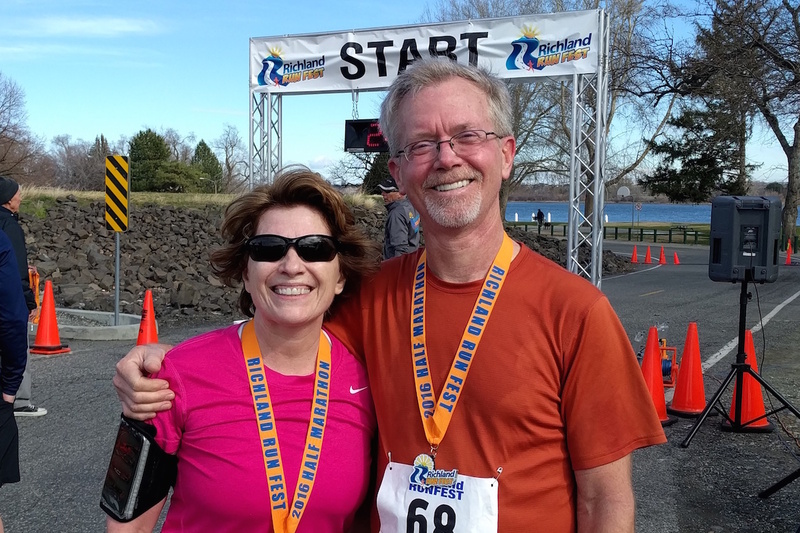 We started together but ran our own races, although we both were setting out to run and finish, not race. After two miles I realized I was running a nine-minute mile pace. I told myself to slow down to ten. I was concerned I'd run out of gas since I hadn't trained. My training had consisted of several four-mile runs over the last month and one six-miler two weeks ago. At the four mile mark I was still at a nine-minute mile pace and again told myself to slow down. Although I thought I was, I wasn't. When I reached the halfway point I was feeling pretty good so I kept up the pace. With about four miles to go I took my Vibrams off and ran barefooted. Side story: We had a new judge come on board last month at work. I hadn't met her yet because she's in our Yakima courthouse. While running barefoot I passed a woman who was also running the half and she asks me, "Hey, do you work at District Court?" I said I did. She introduced herself and I got to meet our new judge. My IT guy in the Yakima office had told her I'd be there and that I like to run barefoot so I made it easy for her to pick me out. Running barefoot felt great at first but then my gas tank started running low. My legs were starting to flag and it was affecting my form, which meant blisters if I continued barefooted. So after two miles of naked feet I put the Vibrams back on. I reached the finish at 1:59 and some change. I was pleased I did so well, more so because it's been so long since I've done any distance running after trashing my ankle almost three years ago. The ankle felt great during and after this run so I'm confident it's back to 100% now. 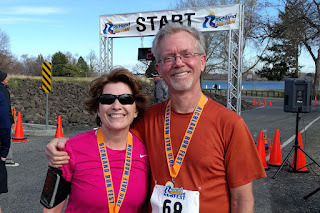 Kathy's second half marathon this year. Surprisingly, I got third place in the men's 55-59 age group, which meant I received an age group winner award--a beer glass. How appropriate.